That's all from this page for the evening. You can follow the second half of Wolves 0-1 Norwich here. Or follow the Ryder Cup here. We shall see you in the morning! West Brom manager Tony Pulis says he is "desperately disappointed" with his side's 1-1 draw away against Sunderland. Bournemouth manager Eddie Howe says he's "disappointed" his side were not able to secure the win after taking the lead twice during their 2-2 draw away against Watford. Caretaker Hull City manager Mike Phelan says "questions need to be answered" at the club before his future can be resolved, following their 2-0 defeat to Chelsea at the KCOM Stadium. 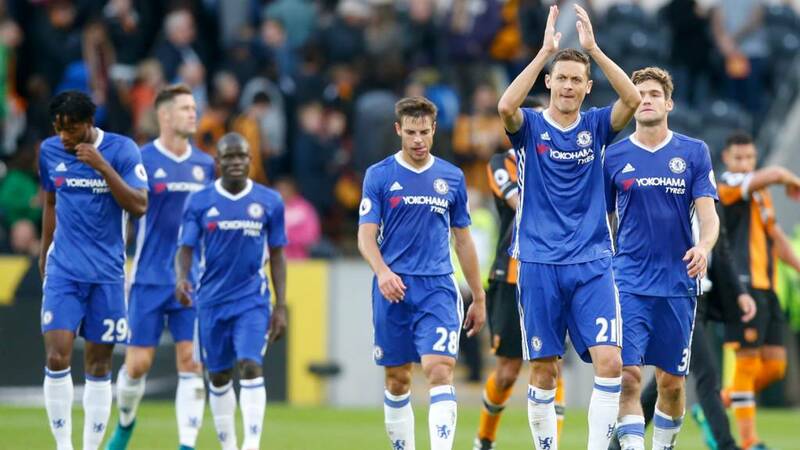 Chelsea manager Antonio Conte says his team "must improve a lot" after their 2-0 victory over Hull City at the KCOM Stadium. Chelsea boss Antonio Conte: "Every game is very tough in England and I am pleased with our performance because we scored two goals and got a clean sheet. I saw the right pressure and the right intensity from the players. "We can improve and we must improve a lot and continue to work. After these two defeats it's not easy to work because two defeats for Chelsea are heavy defeats. But this was a good answer. "Now I have to wait for the players to return from 10 days to prepare for the game against Leicester. I hope they come back without injury and we start to work again and follow this road." West Ham manager Slaven Bilic on his side's poor start to the season: "I feel pressure because I am not happy with our position in the table and because we lost four matches on the trot. It is below my standards. "But I believe in my team and I'm a hard worker. Although we didn't win today we showed that the team is alive. We are together, we have to show it more often." On young full-back Sam Byram going off early after suffering another injury: "He didn't even kick the ball, he stretched. Maybe it is psychologically too much pressure. It was a shame that it happened to him when he had his chance. It is his hamstring. He heard a pop. We don't know the length." Chelsea manager Antonio Conte: "It's an important win after two defeats.This win is important for the team because we are working hard. After two defeats it's not easy because you must work and also to find the resolution to change and to improve. "Today we did a good performance with the right intensity and pressure. I like it when the team plays in this way. I like it so much. It was a good reaction from the players, because after two defeats it was not easy. I saw many of the players with great commitment, attitude and will to change the situation. I am pleased for them. "We are working very hard and I am sure we can improve a lot if we continue to work in this way. I am pleased for all the players because in these situations because we have a clean sheet. In previous games we conceded too many goals. To finish with a clean sheet is very important. We also scored two and the performance is good. We must follow this with work, work, work!" The finale of the day came at The Abbey where nine-man Cambridge survived two red cards and two penalties, all in stoppage time, to beat Accrington 2-1. Will Norris saved both Stanley spot-kicks. Leaders Plymouth still hold a five-point lead after a 4-1 win over Yeovil. Doncaster are second after a 2-1 win at Portsmouth. Carlisle are still one of three of the 92 English teams, along with Manchester City and Bradford, to remain unbeaten this season in league football. Newport remain bottom on six points after their match against Stevenage was postponed because of a waterlogged pitch. The same fate had befallen the match between Notts County and Morecambe, which was abandoned after 10 minutes. West Ham manager Slaven Bilic on his side earning their first point in five matches: "We stopped that losing streak with a point but we were looking for three considering we were playing at home against a side in the bottom half. The guys gave everything. They showed character and what the team is about, they showed spirit and also quality. That's what I demanded. But it was not enough to win the game. "We didn't create lots of chances but it was a fighting game. There were a lot of positives from our performance." On Dimitri Payet's brilliant solo goal: "It was an unbelievable goal, it was a pure magic. It was only a shame it wasn't a winning goal. We needed that moment of class from our best player to lift the whole team up." Hull caretaker boss Mike Phelan on talks over taking the job permanently: "My situation has fluctuated from week to week but we're not far apart. We are talking and having lunches together, the owners and I. It's just a case of where it all stands. "When you take a role on like this you want to know what's in front of you. Hopefully the terms of agreement will be reached. "My situation is not the most important thing. I'm carrying on trying to take this team as far forward as possible. It's just a case of the owners now sitting down and settling those small issues that need to be solved." West Brom boss Tony Pulis: "We needed a second goal. We had 21 crosses and 18 shots. "When you’re 1-0 up there’s always a chance to make a mistake and they can score. Fair play to Sunderland - they kept at it. Their supporters were fantastic and got behind them. They had a lot of possession - but we were happy to let them play backwards and square. We had good runners, just lacked quality in the final third. "We’re desperately disappointed not to have won. We’re not doing too badly. It’s progress. Although it’s slow, it’s progress. On goalscorer Nacer Chadli: "He’s a good player. He can play off the sides or as a 10, and could even play as a striker." Watford manager Walter Mazzarri after his team earned a point on his birthday: "I look at the performance not much at the points. One point today, given the intensity, I am happy with it but I am very happy with the performance. "(Isaac) Success was excellent, playing in the past not just today. He can improve a lot mainly in the defensive parts but he has a lot of potential. "The players have given me a nice present today. If they had have been slightly more concentrated they would have given me three points but I am happy now." Hull caretaker boss Mike Phelan: "We were quite pleased we created a few issues for them in the first half, but we expect a team like Chelsea to ramp up the pressure a little bit. Although I think at times in the second half we were a victim of our own poor decision making and passing. "Now we have to get together and move forward. We have a few more games now where we can hopefully be competitive. I don't think there's any issues with the players who are here, they are trying to win football matches. "It has been difficult to get forward but we're not playing Mickey Mouse teams here. We have to be sensible with our approach and can't just be open against these teams." I was just about to tell you that the game at Wolves had kicked off when Norwich opened the scoring, Cameron Jerome heading home. Check out the latest here. The Norwich kit has to be seen to be believed. Sunderland boss David Moyes: "We didn't get the three points. We didn't deserve to be 1-0 down. We had a great chance through Jermain Defoe - expected him to score. We're pleased we got a point out of it. "I'm still disappointed we didn't take the three points. "Their energy and commitment was great. Undoubtedly we're lacking quality - we had no forward players to put on. Patrick van Aanholt came on and got us a goal. "There was bits of play that got us a chance. Jonny Evans made a good block from Jermain Defoe. "We need Jermain to score more, although he has got us goals. "We defended much better today - that's a positive. "The point gives us something to build on. We needed the three points though." There's a late game still to come in the Championship - and you can follow it here.